This puzzle was inspired by “My Fair Lady” and was written as a promo for my upcoming Broadway Puzzlefest. It plays on the fact that Eliza drops her H’s due to her Cockney accent. I was involved in a puzzle with a similar concept, back when I was on the writing team for the MIT Mystery Hunt, but for this I focused on words with H at the beginning. RECEDINGAIRLINE was the seed entry. The EPSOM area in the W was a little tricky, and I deliberated over the spelling of DORAG since I’d recently seen it spelled with a U in a tweet by Roy Wood Jr. I had fun getting some Broadway refs into the clues, as well as a few things from my childhood. I was obsessed with “The Greatest American HERO” as a kid. I mean, with a theme song like this, can you blame me? First and foremost, thank you for being patient with me as the past three Mondays before today were spent in the middle of tennis madness at the US Open. 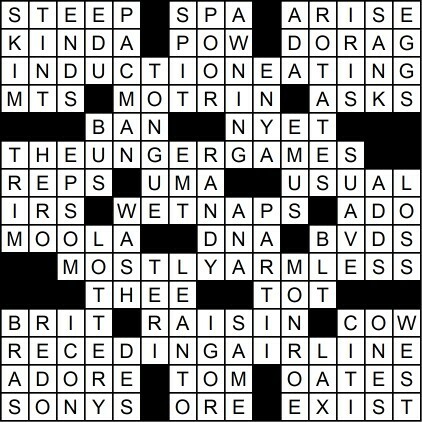 Today’s crossword is inspired by the Cockney accent of the lead actress in the lovely musical “My Fair Lady,” Eliza Doolittle; Each theme entry is a pun that is formed by removing the “H” (and its corresponding sound) from the beginning of one of the words. INDUCTION EATING (17A: [Consuming spicy food when you’re nine months pregnant, e.g.? : 2 wds.]) – Induction heating. THE UNGER GAMES (26A: [Story about neatnik Felix’s love of Monopoly and Clue? : 3 wds.]) – The Hunger Games. MOSTLY ARMLESS (46A: [Like the Venus de Milo? : 2 wds.]) – Mostly harmless. RECEDING AIRLINE (61A: [Carrier that’s cutting back? : 2 wds.]) – Receding hairline. A-HA Moment (When I figured out the theme): The first theme entry I ended up filling out in its entirety was the “mostly armless” one, and, once I looked back above at the two theme entries and its cluing, knew what would be going on with the rest of them. O-HO Moment (Something I know now that I didn’t know before): I clearly was not familiar with “Into the Woods,” so I was totally at a loss when coming across the clue for COW (58A: [Milky-White in “Into the Woods,” for one]). Was hoping it was some sort of animal, and then when I was able to fill in two of the three letters through crossings, that specific animal came into light much more. soap and towels at my disposal when I finish a meal at home. Sportsball moment of the day: Starting tomorrow, There are a couple of prominent sports figures who go by the nickname of PACMAN (5D: [Ghost-gobbling arcade game: Hyph. ]), the most notable being Manny Pacquiao, the boxing legend from the Philippines who has won titles at eight different divisions. Then there’s current Cincinnati Bengals defensive back Adam Jones, who had gone by the nickname “Pacman” for many years but ditched it in a attempt to separate himself from his past, which included a number of run-ins with the law. Thank you so much for your time, and I hope you all have a good rest of your week!